In Syria, the climate is Mediterranean on the coast, with mild, rainy winters and hot, sunny summers, while it is arid subtropical in the vast inland areas, with moderately cold winters and scorching, sunny summers. Summer is sunny throughout the country, but the air is humid on the coast and dry in the rest of the country. In spring, and less often in autumn, Syria can be affected by strong southerly winds, which cause sandstorms and raise the temperature considerably. Latakia is located on the coast, and has a Mediterranean climate. The average temperature ranges from 12 °C (53.5 °F) in January to 27 °C (81 °F) in August, which is, albeit slightly, the warmest month on the coast (but often also in the interior). Here are the average temperatures. Precipitation amounts to 770 millimeters (30 inches) per year, concentrated from October to April, with a maximum in winter, which is definitely rainy: in December and January, 150/160 mm (5.9/6.3 in) of rain fall per month. Summer, when it never rains, is hot and sunny, but tempered by the breeze. Here is the average precipitation. The sun in Latakia regularly shines in summer, while in winter, there is an alternation between cloudy and sunny days. Here are the average sunshine hours per day. The Mediterranean Sea is warm enough for swimming from June to October, as we can see in the following table. Behind the coast, there is a mountain range, known as An-Nusayriyah, which reaches 1,562 meters (5,125 ft) in height and separates the Mediterranean region from the mainland. The interior is largely occupied by a plateau, at an altitude between 400 and 1,200 meters (1,300 and 3,900 feet) above sea level, while the altitude of the Euphrates Valley (see Raqqa, Deir ez-Zor) is lower, about 200/300 meters (650/1,000 feet). In this area, the temperature decreases with increasing altitude, especially at night and in winter, while summer is usually hot because of the distance from the sea. There are also some mountain ranges: in addition to the aforementioned mountain range parallel to the coast, there is the Anti-Lebanon range in the south-west, dominated by Mount Hermon, 2,800 meters (9,185 ft) high, while in the south-west, in the As-Suwayda Governorate, we find the Jabal al-Druze, which reaches 1,803 meters (5,915 ft) in Tell Qeni, and where it can snow in winter. As regards to the rainfall, the wettest areas of the interior are the western mountains: in the mountain range parallel to the coast, rainfall exceeds 1,100 mm (43 in) per year, while in the Anti-Lebanon, they exceed 900 mm (35 in). In the Jabal al-Druze, further south and away from the sea, it exceeds 400 mm (15.7 in). On the plateau, the rainest areas are the northern one along the border with Turkey and the western one, where annual rainfall exceeds 300 mm (12 in), and in some cases even 500 mm (20 in), and the climate is semi-arid. For example, in the north west, 500 mm (20 in) of rain per year fall in Idlib, and 330 mm (13 in) in Aleppo, while in the west, 430 mm (17 in) fall in Homs. In the north-east, 430 mm (17 in) fall in Qamishli as well. In the rest of the plateau, including in Damascus, rainfall drops below 250 mm (10 in) per year, and the climate is desert. 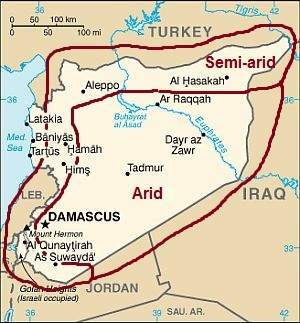 However, as we have said, the summer is dry throughout Syria, so this distinction, which is shown in the following map, only applies to the cold half of the year. In the interior of Syria, the climate is fairly homogeneous, however, in winter, it's a bit colder in the north, while in summer, it gets warmer as we move away from the sea. This means that the most continental areas are those of the north-east, as we can see from the mean temperatures of Qamishli, at 400 meters (1,300 feet) above sea level. As mentioned, in Qamishli, 430 mm (17 in) of rain or snow fall per year, which are concentrated, as usual, in the cold half-year. Here is average precipitation. In Qamishli too, the sun regularly shines in summer, while in winter, there is an alternation between cloudy and sunny days. Aleppo, located in the north-west, at 400 meters (1,300 feet) above sea level, has a quite cold winter, with an average in January of 6 °C (43 °F), while summer is hot, with an average in July and August of 28.5 °C (83.5 °F). Here are the average temperatures. As mentioned, precipitation in Aleppo amounts to 330 mm (13 in) per year, and occurs between October and May, but it's moderate only in winter, while it never rains from June to September. During winter, from December to February or early March, cold spells, lasting a few days, with snow and frost, may occur. During some years, the rains from December to March can be abundant. Here is the average precipitation. The archaeological site of Ebla is situated in the west, at 400 meters (1,300 feet) above sea level and 85 kilometers (50 miles) away from the sea, and has a climate similar to that of Aleppo. 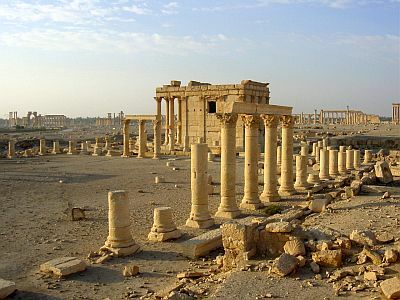 Palmyra, near the modern city of Tadmur, is located in an oasis in the center of Syria, at 400 meters (1,300 feet) above sea level, and it's less rainy, although it has similar temperatures: the daily average ranges from 7.5 °C (45.5 °F) in January to 30 °C (86 °F) in July and August. Precipitation amounts to only 130 mm (5.1 in) per year and is concentrated, as usual, from October to April, with a maximum in winter. Here is the average precipitation. The capital, Damascus, is located in the south-west, 700 meters (2,300 feet) above sea level and about 80 km (50 mi) away from the sea. The climate is not much different from that of Aleppo here as well, with fairly cold winters and torrid (hot and dry) summers. The average temperature ranges from 6.5 °C (43.5 °F) in January to 26.5 °C (79.5 °F) in July and August, but the higher altitude makes the summer nights cooler. Here are the average temperatures. Precipitation in Damascus amounts to around 160 mm (6.3 in) per annum, however, here too, snowfalls and frosts can sometimes occur from December to February. Here is the average precipitation. In Damascus, and in the south in general, the sun in winter shines a bit more often than in the north, while in summer, as in the rest of the country, the sky is almost always clear. The best times to visit Syria are spring and autumn, and in particular, the months of April and October. In winter: in Aleppo, Damascus and the plateau: pack warm clothes, such as a down jacket, a hat, a raincoat or umbrella, a scarf for the wind-borne sand and dust, and hiking shoes. On the coast, pack spring/autumn clothes, a sweater and a jacket, and a raincoat or umbrella. In summer: in Aleppo, Damascus and the plateau: pack lightweight clothing of natural fibers, a desert turban, hiking boots, a sweatshirt or sweater for evenings outdoors, and a sleeping bag for outdoor overnight stays. For the coast, pack light clothing, and a light sweatshirt for the evening. It's better for women to avoid low-cut dresses.